In my last post, we covered adding the VM requester's AD account to local administrators on the guest. This is a quick and dirty way to getting the machine requester up and running with their new VM. However, many organizations prefer to use AD security groups for this kind of access. In fact, if you use an AD group to control local admins for a Windows VM, then you can create actions for the provisioned VM so that the owner can assign local admin to whomever they wish. In this post we will cover the following use case - a new VM is requested and as it is being provisioned, a new AD security group will be created in a designated OU with the name of the VM and some custom suffix (like "vmname-localadm"). The requester of the VM will be placed into this group by default and the new group will be added to local admins on the machine after it has been built and customized. There are a few requirements for this that will not be covered here. I have provided links to help you get started with those requirements where appropriate, otherwise you should be able to address them with the VMware documentation. The scripts and vCO workflows below are provided as-is and should always be evaluated and tested before running. I make no warranty nor provide support. You will need to add the VBScript below to your VM template. This script will be called by the Guest Agent to complete the task of assigning the security group to local admins on the new VM. Be sure to check to see that the file is not blocked. Now you will need to import a vCO package I created to do this work. It contains two top level workflows which will be called from vCAC workflow "stubs" - download here. 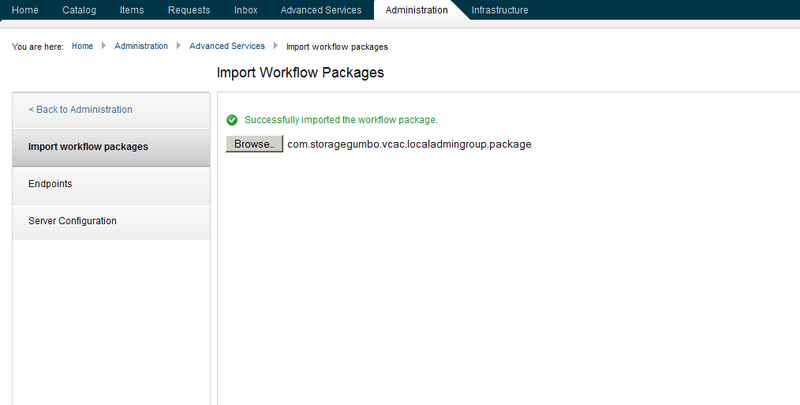 This is most easily done from vCAC under Administration > Advanced Services > Import Workflow Packages as shown below. If you are comfortable importing a package from the vCO client you may choose to do it that way to see all the elements that will be brought in and note any conflicts. Once imported there are two vCAC Extensibility workflows you will need to run in vCO client to associate the "Create" and "Delete" workflows with the appropriate vCAC workflow stubs. First, run the workflow Library > vCloud Automation Center > Extensibility > Workflow stubs > "Assign a state change workflow to a blueprint and its virtual machines." -Select the "BuildingMachine" workflow stub and set the vCAC Host to your IaaS host. - The "End user workflow to run" will be the workflow storagegumbo.com > Manage Local Administrator > "vCAC Create Local Admin Security Group"
- Select NO for "Add last vCO Workflow run input values...."
- The "End user workflow to run" will be storagegumbo.com > Manage Local Administrators > "vCAC Delete Local Admin Security Group"
- ExternalWFStubs.BuildingMachine.strGroupSuffix should be set to the security group suffix you want to use. The result will be a group called - for example, WINSRV01-LocalAdmins. ExternalWFStubs.BuildingMachine.strTargetOU should be the AD OU where you would like the group to be created. You MUST have created this OU and you cannot use the standard Users container in AD. To activate the guest agent and have it run the VBScript above, you will need to add properties in the green boxed area. NOTE that the ScriptPath property should reflect the path and filename of the VBScript (may be different than pictured) but the items in curly brace should look exactly as they do in the example above. At this point you are ready to test this out by deploying a machine from the blueprint. Note that I have only tested with 6.0 but it should work with 5.2. I followed the steps and getting "TypeError: Cannot read property "userGroups" from null (Dynamic Script Module name : getUsergroupFromContainer#52995)"
In addition to the properties shown in your screen shot, 3 more added in my case. Have you configured the AD plugin in vCO? yes I have the AD plugin configured. Have you already created the Target OU (container) in AD? Yes I have the AD OU container but it has space in it. I wonder if that makes it fail. Getting "TypeError: Cannot read property "userGroups" from null (Dynamic Script Module name : getUsergroupFromContainer#52995)"
It seems ouTarget is blank. Well, in my example above I used an OU with a space in the name for the ExternalWFStubsBuildingMachine.strTargetOU custom property value. Verify that you have entered the custom property name correctly. Thanks John, somehow the value of ouTarget is passing blank. even though custom property strTargetOU is passing the value for OU. The workflow "vCAC Create Local Admin Security Group" should create a log entry like ""Found target OU " with the OU name. Do you see that in the workflow log? yep , it is creating the AD group now. I had been passing full OU path and not realizing it is searching by just OU name. Is it creating the user group in AD? That should happen just prior to this error. Would you email me at diasj - at - vmware - dot - com? I need more information and logs/screenshots of what you are seeing. Thanks. Hi John, I just emailed you the log and screenshot. great stuff, we use this in our environment! We just moved on to vRA 7.1. You should be able to use this within the 7.1 framework. But instead of work flow stubs, you should leverage the event broker. Thank you, kind stranger. I've corrected the link. Sorry, I have not seen that.